(15/P33) TRENTON – The Christie Administration and U.S. Army Corps of Engineers today announced the start of major beach construction projects in Cape May and Monmouth counties. The federally funded projects, totaling nearly $96 million, are critical components of the Administration’s comprehensive strategy to protect communities and make New Jersey’s coastline stronger and more resilient in the face of future storms. A contractor for the U.S. Army Corps of Engineers’ Philadelphia District this week launched work on a $57.6-million contract to construct beaches and dunes in southern Ocean City, the Strathmere section of Upper Township, and Sea Isle City in Cape May County. In Monmouth County, a contractor for the Army Corps’ New York District also started work on a $38.2 million project to construct beaches, make stormwater outfall improvements and implement modifications to existing groins in the area of Loch Arbour, Allenhurst and Deal. The projects are being funded by $1.2 billion appropriated by Congress to rebuild and strengthen New Jersey’s beaches following Superstorm Sandy in October 2012. Department of Environmental Protection Commissioner (DEP) Bob Martin joined Lt. Colonel Michael Bliss, Commander of the Corps’ Philadelphia District for a news conference in Ocean City to announce the start of the Cape May County project. The Commissioner also joined Colonel Paul E. Owen, Commander of the New York District, at a separate news conference in Allenhurst to announce the start of the Monmouth County project. In Cape May County, the Army Corps began placing sand in the area of 42nd and 43rd streets in southern Ocean City. Work in the southern end of Ocean City, from 34th Street to the northern boundary of Corson’s Inlet State Park, will involve construction of a dune approximately 13 feet above sea level, with a 25-foot-width at the top and a beach extending 100 feet from the seaward base of the dune. On Ludlum Island, which encompasses the Strathmere section of Upper Township and Sea Isle City, the dune will be 15 feet above sea level and 25 feet wide at the top. The beach will be 50 feet wide. The contractor is Great Lakes Dredge & Dock Co. of Oak Brook, Illinois. More than 4.2 million cubic yards of sand will be pumped over the 9.1-mile length of the project. Crossovers will be repaired, sand fencing installed and dune grasses planted. “This is the culmination of a long process that involved a lot of hard work,” said Lt. Colonel Bliss, Commander of the U.S. Army Corps of Engineers' Philadelphia District. “The State of New Jersey and the local communities have been great partners in helping to plan and design these projects and move them forward to construction. In Monmouth County, Seattle-based Manson Construction Co. is beginning work on the first part of a two-phase project that will close a five-mile gap in the stretch of coastline between Sea Bright and Manasquan that was reconstructed after Sandy. "I'm very pleased to see this project moving forward because it will allow us to complete the final 21 miles of shoreline between Sea Bright and Manasquan," said Colonel Owen, Commander, Army Corps of Engineers, New York District. "This is another example of great teamwork at the local, state and federal level--all of whom are working extremely hard to continue increasing the resiliency of the Jersey Shore following Hurricane Sandy." The first phase of the projects calls for pumping 1.4 million cubic yards of sand on 1.6 miles of beach in Loch Arbour, Allenhurst and southern Deal, along with extensions and improvements to six existing stormwater outfalls and modification of two existing groins, which are coastal protection structures that extend from the beach into the ocean. The beach will be 100 feet wide. The second phase of the project calls for placement of 1.4 million cubic yards of sand on two miles of beach in northern Deal and the Elberon section of Long Branch, along with extension and improvements of nine existing outfalls and modification of an existing groin, This contract scheduled to be awarded this summer. 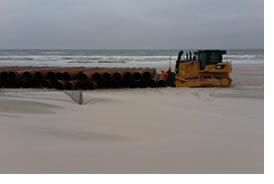 Other beach construction projects scheduled to commence in 2015 include beach and dune construction at Long Beach Island, including Long Beach Township, northern Surf City, Ship Bottom and Beach Haven; Absecon Island at southern Ventnor, Margate and Longport; and the Northern Ocean County peninsula between the Manasquan and Barnegat Inlets, including Point Pleasant Beach, Bay Head, Mantoloking, Brick, Toms River, Lavallette, Seaside Heights, Seaside Park and Berkeley. Last year, the Army Corps of Engineers, in partnership with DEP, completed eight post-Sandy beach repair projects, returning roughly 45 miles of previously engineered and constructed beaches along the New Jersey coast to their original protective construction design at a cost of $345 million. The Administration’s resiliency strategy also includes, among other things: the Sandy Blue Acres buyout program, which will move 1,300 residential properties in flood prone areas to move residents out of harm’s way and create natural buffers against severe weather events; financing of projects that will bolster protections for water and wastewater infrastructure; establishing more protective reconstruction elevation standards in flood zones; and providing financial assistance for flood elevations of homes.